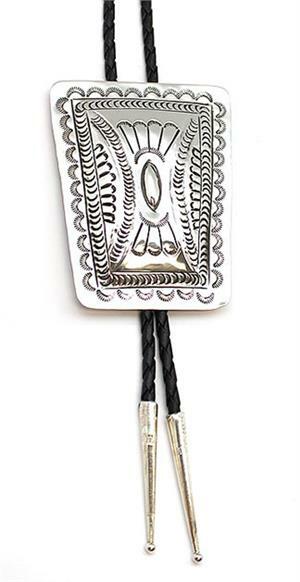 This sterling silver rectangle bolo has assorted stamping. It measures a little over 2 1/4" wide and tapers down 1 7/8" wide by 3" long with vinyl chord measuring approximately 44'' long end to end with sterling silver tips. Native handcrafted by Navajo artisan Carson Blackgoat. Stamping will vary.